Need more information about booking Home 7384677 ? Chelsea Cottage, with its fabulous view overlooking the English Channel, is extremely comfortable and well-equipped, and has been comprehensively renovated and redecorated to a high standard throughout. The lounge, front bedroom and patios face south east and command a panoramic view of the English Channel and its shipping; the top patio receives the sun all day. The cottage is set back from the street and is very quiet. There is satellite TV, a DVD player, radio/CD player, internet/wifi, a large assortment of board games and a good selection of books, including literature about the Island. In the front bedroom there is a large desk which makes this a great place for those wanting to get away to work in a peaceful environment with a view. The well-equipped kitchen adjoins the dining room, which seats 6 comfortably. The stairs are quite steep, but there is a handrail, and 2 stair gates are provided. Steps lead down to the secluded lower patio where there is a garden seat and washing line. 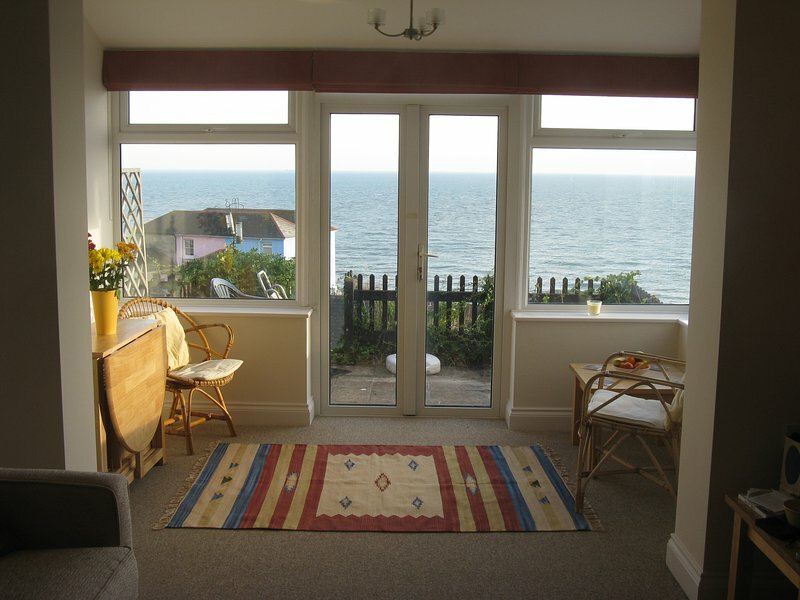 The cottage is ideally situated, since, while quiet and with a fantastic view, it is in Ventnor town and so close to shops and other facilities. It can also easily be reached by public transport (frequent local bus services to all parts of the Island). It takes 10-15 minutes to walk to Ventnor and Bonchurch beaches. Today Ventnor has all essential shops as well as an interesting selection of cafés and restaurants catering for all tastes and pockets. Fish landed straight from the boat is on sale daily at the harbour. The Isle of Wight packs a huge amount of interest into a small space and has numerous events such as the Walking Festivals, Cycling Festival, Isle of Arts festival, Music Festivals, and Garlic Festival, Ventnor Fringe, and each town has its own Carnival in August. Ventnor and the Undercliff are renowned for their benign climate, since they receive the fresh sea air and are sheltered from cold northerly winds. The famous Botanic Gardens, built on the site of the old TB hospital is within walking distance and has amazing plants from all over the world and a pleasant cafe, restaurant and gift shop. If you don't have a car, it is very easy to get around by bus. The number 3 goes from Ryde, through Sandown and Shanklin and on to Ventnor, before going on to Newport (via Godshill). The bus-stop nearest our cottage is Ventnor library. From Shanklin and Newport there are other bus routes to different parts of the island. There are two tourist bus routes: Island Coaster and Needles Breezer. More info at http://www.islandbuses.info/ There are a lot of off-road cycle routes and bikes, including electric bikes, can be hired in various places. There are wonderful walks, both coastal and inland that can easily be combined with bus routes. Before you arrive, you will be given a code for the keysafe. As we don't live nearby, we won't be there to meet you, but there are details in the cottage of local people to contact if you have any problem. You can contact us at anytime by email or phone. We do not accept bookings for hen or stag parties or for groups of under-18s. The property is not suitable for big parties. Unless it is a family group, all guests must be over 18. This House has 2 bedrooms, 1 bathroom and sleeps 7. It’s been listed on Holiday Lettings since 22 Dec 2016. Located in Isle of Wight, it has 17 reviews with an overall rating of 5. The average weekly rate varies from £602 to £1031. Chelsea Cottage is home from home We have been that many times that we feel so comfortable and at home, it has everything we could possibly need, but the best thing ever is not only the totally amazing view but listening to the waves crashing on the costal wall at night. This is the third time we've rented CC. It's ideally situated in Ventnor and the view is fantastic - even on rainy days!